Petter Nilsson once exemplified the chef-as-forager trend. 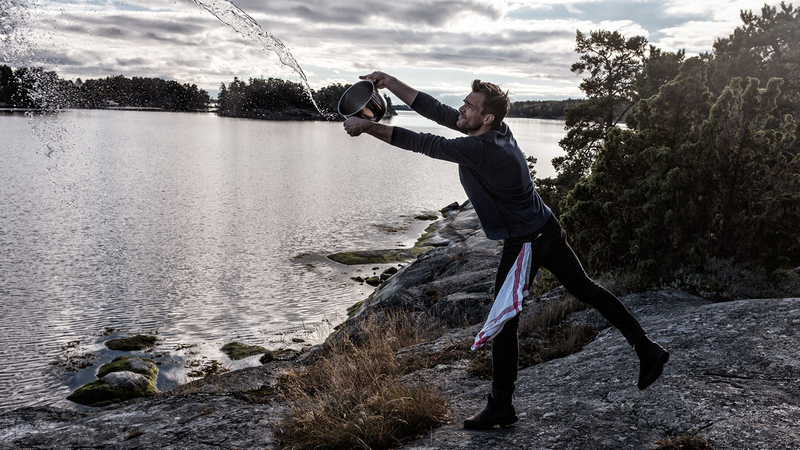 Now, at Stockholm's Museum of Spirits, he's redefining what visionary Nordic cooking can be. If there's one concept that has obsessed ambitious chefs over the past few years, it's foraging. As the quest for hyper-local ingredients has intensified, foraged has become almost as ubiquitous a term as farm to table. But way before cooks scoured meadows, beaches and even city sidewalks for wild ingredients, Petter Nilsson championed the idea. Revered by the world's best chefs, the cerebral fortysomething Swede has always been ahead of the curve, highlighting vegetables before just about everyone else and rethinking French food at his Paris restaurant, La Gazzetta, before the bistronomy trend began. Now chef at the Spritmuseum (Museum of Spirits) in Stockholm, Nilsson talks to Food & Wine about his fascination with flavors from around the world. Let's begin with a brief history of Petter Nilsson. I started my career in southern Sweden, not far from where I was born. I began culinary school when I was 14, then went on to Rut På Skäret, the first avant-garde restaurant I ever cooked at. Even before the start of the foraging era, we were out searching for nettles and berries. The restaurant was located in a very traditional Swedish town, near where the king bought his cakes on Sundays. I arrived at Petri Pumpa around the time it was voted best restaurant in Sweden. The cooking was very minimalist—a carrot served with a cumin seed and an anchovy. There was a big wow feeling about it. That's the basis for the Nordic Kitchen Manifesto, the decade-old guide that launched restaurants like Copenhagen's Noma. If you read the original manifesto, it includes the importance of using local, seasonal ingredients. At Petri Pumpa we wanted to challenge the idea that we had to use a French medallion of lamb. The lamb doesn't have to be French; we don't even have to serve lamb at all. If we don't have good peaches, why order them all the way from Italy? We shouldn't think that ingredients and techniques from elsewhere are better than our own. Then you moved to France, the birthplace of grande cuisine. This wasn't the kind of food you'd been cooking. The food in France has true history behind it. I had my own restaurant in Southern France, in Uzès, in the mountains. The food was quite simple; there were a lot of hunters and foragers who picked nuts and mushrooms for me. It was a small town; I was this exotic Swedish guy, kind of angry because I couldn't speak French, yelling at the fishmonger and throwing stuff in the street. I opened La Gazzetta in 2006. We were part of changing the Parisian restaurant scene. We served dishes in a slightly different way, like new potatoes with seaweed butter. Now you've come back to Sweden. Do you still see carrots as a luxury ingredient? I see luxury as eating a sweet carrot, but really, it's more than that. Eating a carrot directly from a neighbor's garden, that was something I did as a kid. There was soil on the carrot; there was my heart beating fast because I was stealing the carrot! I am more interested in the sensation of my heart pounding than the concept of a carrot in the soil as luxury. The lobster I make with vinegar-infused pomegranate seeds evokes the feelings I had in my early teens when I'd try all the different pots and jars in the fridge at home. What do you think about the Nordic manifesto now? The militancy can be scary. That was never the Nordic way. Restaurants shouldn't have to be so focused. You wonder, What is the limit? Does your dishwashing liquid need to be local, too? I like different cultural influences. I make soy sauce in my kitchen; I use it in my lobster sauce. I do have a problem with something ecologically bad: flying a few shrimp from Iceland to Stockholm. I waste very little; I make plum tartlets, and my favorite part is the cream flavored with the crushed plum pits. Do you have a philosophy of wine? The wine is much like my food: natural, organic. I'm a sucker for oxidized wines, mainly from mountains in the Jura and Friuli covered in snow during the winter. Is it time to explore new frontiers in your cooking? Maybe. I have thoughts like, Perhaps I can perfect cooking lamb shoulder, and always cook it like that. Or, I will always wear one type of underwear. But I'm too restless to do that. I'm like Groucho Marx in that way; I think he said, "Those are my principles...if you don't like them, well, I have others." What has influenced your food the most? It's not another cook. It's music from the early '80s: Dead Kennedys, The Clash. It's not about revolt. What I like is the feeling that everything is possible.